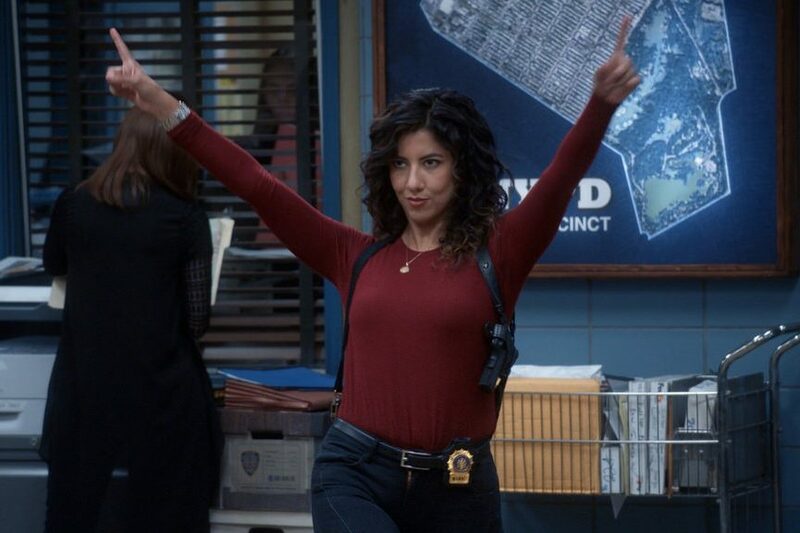 One of the main characters, Rosa Diaz, played by Stephanie Beatriz. As the start of the reoccurring Halloween heists, this episode is a fundamental part of the show. While conversing with his fellow detectives about the intelligence of the criminals caught on Halloween, Jake makes the statement that he would be able to steal without getting caught. When Captain Holt directly opposes Jake’s remark, they make a bet that Jake won’t be able to steal Holt’s Medal of Valor before the night’s end. The Jimmy Jab games were created when the detectives were on call for 9 straight hours. With nothing to do, Jake created a game and it soon evolved. In this episode, when Captain Holt and Terry are heading out for a meeting, the detectives prepare for and play the 7th Jimmy Jab games. When Captain Holt appears to be in an irritable mood one day, Jake recruits Gina and Kevin to help him find out what happened. They spend the day retracing Holt’s routine and find the root of the problem. After Jake and Amy inadvertently cause the death of their new Captain, the whole nine-nine crew is forced to attend his funeral. Throughout this episode, there are small side-plots for most of the main detectives. While investigating an old case, Captain Holt and Jake come down with a case of the mumps and are quarantined for nine days. This gives them plenty of time to work towards solving the case, even through some delirium that sets in. This episode sits in the middle of the Jimmy “The Butcher” Figgis story line. When the crew needs someone to infiltrate a prison in Texas and get close to Figgis’ sister, Amy is eventually chosen. With Jake, Charles, Amy busy with that, the rest of the nine-nine continues to investigate the case from New York. Still within the Jimmy “The Butcher” Figgis story line, Jake and Captain Holt are sent to witness protection in Florida. Their new identities allow them to fly under the radar. While Holt seems to be taking this change in stride, Jake has trouble adjusting. When he suddenly develops a new attitude toward the living arrangement, Holt finds out he’s been investigating the case behind his back. This is the second Halloween episode on the list. While both of the episodes included are entertaining, this is the peak of the Halloween episodes to date (although the Halloween episode in season five ends in a great way). With competition running strong through the detectives’ veins, they divide into teams and the yearly heist begins. The different strategies that the teams come up with are just part of the reason this episode is amazing. This episode start with the full bullpen. While it may have nothing to do with the episode, it is an amazing moment. The actual episode focuses on Terry and DC Parlov, the author of Terry’s favorite series, the Skyfire Cycle. It also shows Gina and Charles fighting for the location of the next Boyle family vacation. This episode shows the development of Amy and Jake’s relationship. When Amy starts freaking out about the sergeants exam and disappears, Jake has Rosa help him follow clues to relocate Amy before she misses the test. DC Parlov needs the help of the nine-nine once again when the manuscript of his latest book is stolen. Jake (a new fan to the series), Terry, and Rosa are set to help uncover the mystery. This episode displays a very accurate take on what being a hard-core fan of something looks like. When Kevin’s life is threatened, Jake volunteers to stay with him in a safe house. He tries to help convince Captain Holt to ease up on the strict security, but Holt has his mind set on doing things his way. The rest of the detectives help with the investigation in anyway they can. During a robbery, a criminal take hostages and then specifically asks for Jake to negotiate with him. When Jake gets to the scene, he realizes it is Doug Judy. He is then faced with either helping Doug Judy or stopping the robbery. This episode is formatted a little differently than the rest, but is one of the best ones yet. Jake calls in a dentist to investigate him for a murder. When Captain Holt becomes aware of the interrogation, he decides to stay and help Jake. The opening of this episode is probably the most iconic opening of the show: Jake has a criminal line-up sing a Backstreet Boys’ song. The episode itself revolves around Jake meeting one of his half-sisters for the first time.